It was a night of highs, lows, surprises, disappointments and ultimately triumph at UFC 58 from the Mandalay Bay in Las Vegas, Nevada on Saturday night. Billed as a battle between two neighboring countries, it became a night notable for a return of a former champion, perhaps the beginning of the road for a future champion, and the unequaled proclamation of dominance of a current champion. 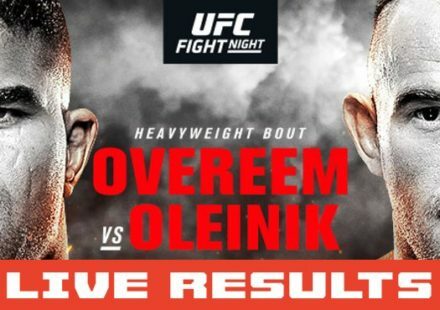 Starting off the evening with the return of the 155lbs division, it was clear that UFC 58 wasn’t going to go how everyone expected when returning “uncrowned lightweight king” Yves Edwards returned to the UFC for the first time in years to take on unknown but highly regarded Mark Hominick. In the first round it was clear that while he possessed a huge disadvantage in experience, Hominick wouldn’t lay down for Edwards. Throughout the first five minutes both fighters exchanged shots, never over-extending or placing themselves in trouble, it was a prototypical feeling out round with Hominick giving just as good as he received from Edwards. In the second it was clear that Mark’s confidence grew as he continued to stand toe-to-toe with Yves, getting slightly more aggressive each time out. Then after an exchange near the cage Hominick landed a vicious left hook to the body, sending the long and lean Edwards back, wincing in pain. Mark quickly jumped on Yves as the two went to the ground where Hominick quickly wrapped his right leg over Yves’ shoulder, telegraphing what was to come. In a surprising move, Edwards, perhaps still feeling the effects of the body shot, did nothing to escape the position. From there it was just a matter of time as Mark worked the triangle closer and closer. Perhaps sensing coming doom, Edwards attempted to posture up for a slam, but Hominick caught Yves’ leg, blocking the move. As the two fell sideways the choke tightened and Yves was forced to submit. Edwards loses his second straight fight and Hominick now becomes possibly the man to beat for the 155lb title should the UFC bring it back later this year. In the night’s second bout Nathan Marquardt, returning after his long ordeal with the NSAC, took on UFC veteran Joe Doerksen looking to even his record in the octagon after having lost 2 of 3 bouts in the company. Early in the fight it was clear that it would be a stand-up battle as Nathan’s size and strength advantage kept Doerksen from taking to the fight to the ground as the two exchanged shots throughout the round, neither taking distinct advantage. In the second round it would be different, Marquardt continuing to dominate the fight would be dropped by Doerksen with a left and then be driven back to the cage with a stiff right hand. However years of being a champion and knowing the heart it takes to do so, Nathan fought back and managed to escape Joe’s attempts to end the fight on the ground. Marquardt recovered and continued to push the pace and put Doerksen on his back towards the end of the round. The final round would be much of the same, exchanges standing fallowed by grappling with Marquardt pushing the action, controlling dominant positioning. In the end Doerksen could mount no offense and could only hold on defensively and Marquardt would take the fight via unanimous decision. While not the most exciting fight in the world, it showed that Nathan can take on top level competition and control a fight. Now it is up to the UFC to decide exactly where Marquardt will fall in the 185lb division as fighters jockey for title positioning. Then would come the evening’s most anticipated fight, BJ Penn would be returning to the octagon where he last left with the 170lb Championship taking on the fighter many consider to be the future champion of the division, Georges St. Pierre. 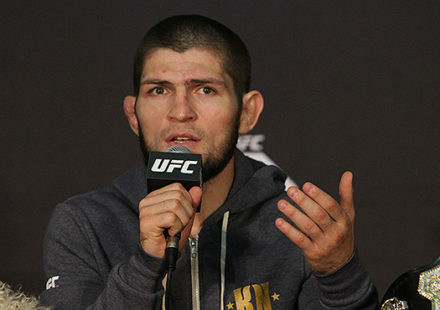 In a fight that somewhat fell short of expectations, it would produce a real gut check for the young fighter and perhaps a wake-up call for the veteran. Early on it seemed to be all Penn. Using a strategy similar to what Randy Couture used against Chuck Liddell at UFC 43, Penn stayed tight and on the inside of GSP. BJ’s shorter, crisper, straighter punches quickly took their toll on Georges’ face, putting a mouse over his right eye and perhaps breaking the Canadian’s nose in the process. No matter what he tried, GSP couldn’t advance and work his game and as the round ended, St. Pierre appeared to have the same bewildered and broken look on his face that he had dealt to many opponents prior to this bout. Perhaps overconfident of his work on the first round, Penn played defensively, allowing St. Pierre to push the action in the second. Penn would mount little offense GSP kept advancing, pushing the pace, never quite getting in on Penn, but still he managed takedowns and gained confidence, shaking off his poor performance early in the fight. The third round would be much the same, St. Pierre would push the action with Penn countering but again not attacking, this would perhaps cost the Hawaiian. St. Pierre would manage more takedowns and would have the all-important “octagon control,” never quite doing a lot of damage, but controlling the fight and his opponent. The round ended with Penn’s most aggressive move in the fight, on his back using his flexible legs to perhaps set up a submission that never materialized. As the round came to an end, it would appear that Penn had given away the fight and two judges saw it as such, giving St. Pierre a split decision. Lacking aggressive behavior BJ surrendered a dominant first round and now St. Pierre will wait as Welterweight Champion Matt Hughes faces MMA legend Royce Gracie at UFC 60, with a guaranteed title shot going to GSP later in the year. In the evening’s swing bout Mike Swick would make his 2006 debut after spending much of the last half year on the shelf with a knee injury as he took on Canadian lionheart Steve Vigneault. Billed as a possible stand up war, the two exchanged briefly, neither landing anything too hard. Swick then shot in for a jumping knee, of which Vigneault caught Mike’s leg, and in the ensuing spin around for position, Mike locked his arm around Steve’s neck as the two fell back. From there it was quick, as is Swick’s nickname, Mike locked his hands and secured guard to sink in a tight guillotine choke, forcing Steve to tapout. Even not 100% Swick continues to impress as he possibly sets himself up as one of the top contenders for the middleweight title later in the year. Then would come the main event. Many thought it would be his toughest test ever as UFC Middleweight Champion Rich Franklin would take on skilled striker David Loiseau for the 185lb title. In what would be Franklin’s greatest gutcheck performance, he and Loiseau would quickly set the pace for the entire fight. Both fighters would come out looking to trade, Franklin with his power, Loiseau with his speed and elbows. In the early going though it prove to be Rich’s night as he would continuously push David back with exchanges of stiff left and right hands, boosting his confidence throughout the first round. To his credit Loiseau did try something different, using a very slender stance, meant for setting up kicks, going repeatedly to the body of Franklin throughout the fight, but it was clear that he was overmatched. Throughout the first two rounds Franklin looked to be in complete control, gaining the advantage on every exchange, controlling the fight when it went to the ground, it appeared as if he could do no wrong. Then something would happen that could have possibly changed the tide of the fight as Rich broke his left hand during an exchange in the second round. Unable to use it effectively to push around Loiseau as he had in the first two rounds, Franklin opened himself up a little and would be dropped in the third round after a counter left hook landed flush for Loiseau. However showing the will of the great champion he continues to become, Franklin would weather the storm and come back and further impose his will. This would go on for the entire five rounds, the two would exchange and Franklin would get the better of Loiseau, forcing him back every single time David would get the slightest advantage. 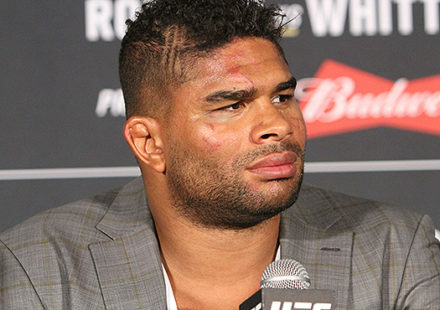 Numerous times throughout the fight it appeared it could have been stopped as Rich was just so dominating, bloodying David’s face and put a brutal swelling over Loiseau’s right eye, the likes of which haven’t been seen in the octagon in quite some time. In the end it was clear, Rich Franklin is just that good of a fighter, broken hand and all he only was in trouble once briefly throughout the 25-minute fight, finishing just as strong as he had begun. The judges’ unanimous decision reflected this as Rich won by as many as 8 points on a scorecard, a huge margin by 5-round standards. After the fight was over, the belt was once again placed around the waist of the now 22-1 Franklin and he would continue to live up to the title of Undisputed UFC Middleweight Champion. One could have a strong argument that Franklin may hold the title for some time to come as the remainder of the division continues to be cloudy with no one singular fighter standing up and producing the kind of dominating performances Rich has. And if he continues to get better each time out as he has in his UFC career, we may just be seeing the beginning of a future hall of fame career for the most dominant 185lb fighter in American MMA. When all was said and done UFC 58 didn’t quite live up to the hype it had surrounding it and that may reflect in attendance and PPV numbers. The team concept, while interesting didn’t prove to be a strong selling point and when it all comes down to it, unless there is some serious rivalry between the individual fighters, country VS country isn’t all it’s cracked up to be. Having said that there were some questions answered and things have become a lot clearer for the future of the UFC. The 155lb division is back and it’s there for the taking if someone steps up. The middleweight division has some definite contenders, but like the lightweights, someone has to step up if they want to take a run at the title. BJ Penn is no longer the 170lb Champion, that title is distinctively Matt Hughes’, but Georges St. Pierre is hot on his tail and may not be denied for much longer. And what else is there to say about Rich Franklin, he is the best fighter in his weight class in the US and possibly in the world, and it’s going to take a lot for someone to change that. In the prelim fights it was Tom Murphy of Ultimate Fight 2 fame, looking very strong against Icho Larenas, the TKO Heavyweight Champion. Murphy proved to be the stronger fighter as he took out Larenas with superior ground n pound in the fight and won by referee stoppage. Jason Lambert may have had one of the most dominant performaces of the night. He quickly disposed of Rob MacDonald by Kimura early in the first round. Lambert continues to steamroll through the competition and could be a contender at 205. Sam Stout shocked many as he beat Spencer Fisher by split decision. Fisher came out very strong almost finishing Stout in the first round. Stout came back and settled down in the second round and landed some great strikes and in the third and final round, Fisher just had no gas left in the tank, as he took the fight just 48 hours before.